The World Soundscape Project's Handbook for Acoustic Ecology, edited by Barry Truax, Professor in the Schools of Communication and Contemporary Arts at Simon Fraser University, is a 160 page reference work, originally published in 1978, which compiles all major terminology from the fields of acoustics, psychoacoustics, environmental acoustics and noise measurement, electroacoustics, music, linguistics, and soundscape studies, with extensive cross-references and straightforward explanations. Numerous diagrams, charts and tables provide additional reference information. 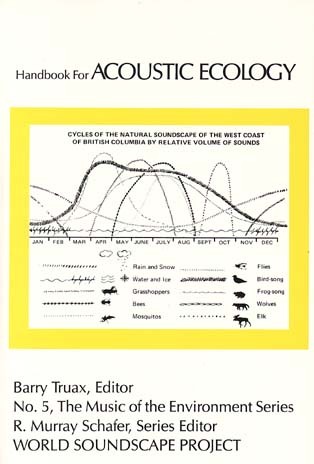 The book is an ideal reference text for students of acoustic communication, electroacoustic music, and any other field where a knowledge of sound is needed. In 1999, a new CD-ROM edition of the Handbook was published, which is also included in the second edition of the author's book Acoustic Communication. A Belorussian translation of this page is also available, as is a Danish one, a Latvian one, and a Bulgarian one.